The Rev. E. Mark Stevenson, director of Episcopal Migration Ministries, right, and the Rev. 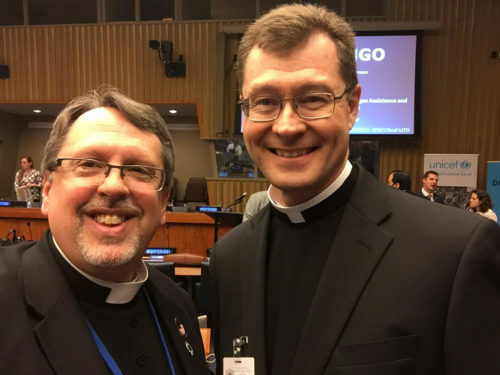 Charles Robertson, canon to the presiding bishop for ministry beyond the Episcopal Church, preceding a panel event on the role of faith-based organizations in refugee assistance and resettlement held at United Nations Headquarters in New York on April 13. [Episcopal News Service] The American spirit of volunteerism, particularly it’s interfaith nature, is something that impressed Abdul Saboor when he first came to the United States as a refugee from Afghanistan, where he worked with the U.S. military in its operations there. When volunteers from various congregations offered to help Saboor and his wife settle into their lives in Syracuse, New York, it made no difference to him, he said, what faith tradition they came from, it just mattered that they cared. The volunteers’ actions inspired him to do the same. He started volunteering with Interfaith Works, an organization that provides resettlement and post-resettlement services to recent arrivals as they build a new life in the United States. Today he works for the organization as match grant program coordinator and he is a student at Syracuse University. The six-member panel event, organized in partnership with LDS Charities, was part of the U.N. Focus on Faith series, which explores how the work of faith traditions and faith-based organizations worldwide aligns with its mission to protect human rights and support sustainable development. 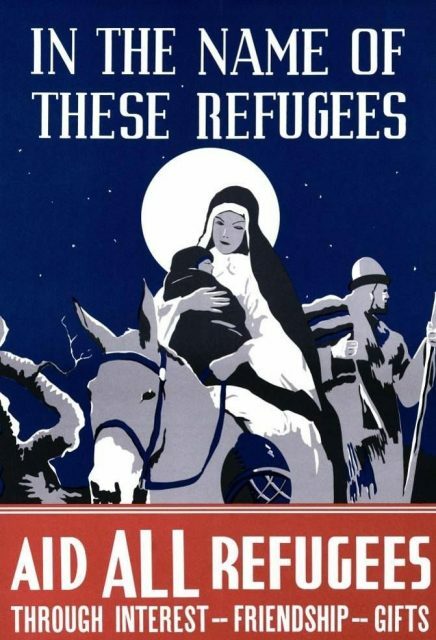 During the 1930s in southern Ohio, the Episcopal Church began formally welcoming refugees fleeing Nazi Germany. In 1938, the Church created a poster depicting a well-known scene from the Gospel of St. Matthew. In it, Jesus is cradled in his mother Mary’s arms, as they along with Mary’s husband Joseph, flee their country after its government instituted an infanticide campaign. Faith-based organizations began working with refugees in during and after World War II, explained Barbara Day, domestic resettlement section chief at the U.S. State Department’s Bureau of Population, Refugees and Migrants. When refugees began fleeing Vietnam in 1975, a nationwide call for assistance went out to congregations who stepped up, she continued, in what was the start of modern-day resettlement program that was later formalized as a public-private partnership in 1980. Episcopal Migration Ministries is one of nine agencies – six of them faith-based — working in partnership with the State Department to welcome and resettle refugees. The agencies receive basic funding from the federal government to resettle refugees. EMM resettled 5,762 refugees out of 85,000 resettled in the United States in the fiscal year 2016. Through its affiliate network, EMM provides direct assistance to recent arrivals. It also offers ways for congregations to engage in refugee resettlement in their communities and encourages Episcopalians to join the Episcopal Public Policy Network and advocate for policies that protect the rights of refugees and asylum seekers. In early April, in response to U.S. policy that will reduce by half the number of refugees resettled annually EMM announced that it will reduce the size of its 31-member affiliate network by six. Episcopalians’ involvement in refugee resettlement, however, doesn’t stop with EMM’s affiliate network. EMM was the only refugee resettlement agency represented on the panel, but leaders of other faith-based organizations shared an overview of their work and partnerships. Islamic Relief USA doesn’t resettle refugees in the United States, but it does work to serve the humanitarian needs of refugees worldwide with the help of partners including LDS Charities, said Anwar Khan, Islamic Relief’s chief executive officer. Through a partnership with Episcopal Relief & Development, Islamic Relief USA is working to prevent violence against women and girls, he added. What started as assisting Ethiopians fleeing to Sudan led to helping Muslims in need around the world and eventually evolved into assistance “to everyone, everywhere,” said Khan. In 2017, the United Nations High Commissioner for Refugees estimates that 1.19 million refugees will need to be resettled. Worldwide, war and persecution have forced a total of 65.3 million people from their homes. Last fall, the U.N. General Assembly hosted the first-ever meeting of heads of state and government to address the large movements of refugees and migrants, aimed at unifying countries behind a more humane and coordinated approach. Since that meeting and following the election of President Donald Trump, the sentiment toward refugees, particularly Muslims, has begun to change. One of Trump’s first actions as president, for example, was to reduce the number of refugees admitted to the United States. And the wave of anti-immigrant, anti-refugee sentiment that began in Europe in recent years in response to the crisis in Syria, has continued. When Saboor first arrived in the United States, people had “lots of images and perceptions of me and my family,” he said. One way counter society’s preconceived and often negative notions of refugees and immigrants is to bring people together and encourage dialogue and in-depth, empathetic conversations, said Saboor. -Lynette Wilson is managing editor of Episcopal News Service.